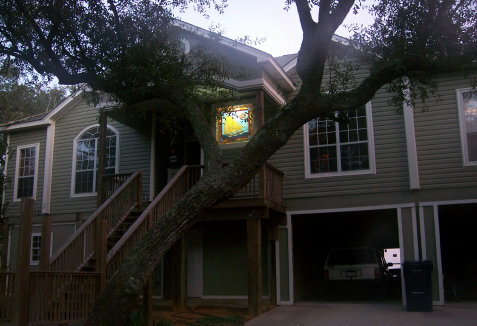 "Lord Terry" stained glass window was custom built for a magnificient waterfront home in Gulf Shores, Alabama. 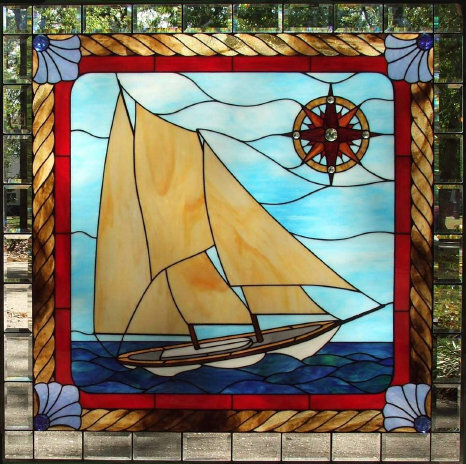 Terry, the owner of this home, is an avid sailor and wanted a design to reflect his passion for sailing, so he actively participated in the design of his window. The Gaff Rigged Schooner depicted is patterned after "Lord Jim", a famous schooner in the early 1900's. The rope, the mariner's compass, and the corner Victorian shell design elements give this window a bold nautical theme as well as a Victorian seaside flavor. This was the first time I have used stained glass to make a rope border. Just the rope itself is 76 pieces of glass. The four round corner blue pieces are actually molded glass smiling moon faces. The outside row of clear bevels creates the effect of a "picture in a picture" and the bevels create rainbow colors in the sunlight. Lord Terry measures 45 3/4" x 45 3/4", contains 280 pieces of glass and was completed in March of 2006. In 2016, Adam French, a stained glass artist in Baltimore, asked me about how to build a stained glass border. Because of his interest, I put together a web page explaining the process (see the link on the left). Recently Adam sent me some photos of a stained glass piece he just finished similar to mine ..... complete with a rope border! Congratulations Adam on such excellent work on a really difficult border. Nice work!